Something Mathieu Baudry said during his press call on Thursday rather neatly summed up this Doncaster Rovers display. “Defend from the front, attack from the back,” was the Frenchman’s motto of choice as he called for individual and collective responsibility from his frustrated teammates. And those words were almost carried out to the letter as Rovers secured their first win in 2018 against a Fleetwood side clearly in free-fall. Boss Darren Ferguson had read the riot act to his players following their feeble performance at Walsall last week. The Scot will accept defeat if Rovers are beaten by the better team. He will understand if his players have the odd off day. But what he will not stand for is watching his team surrender and fail to compete like they did at the Bescot Stadium. He subsequently made five changes to his starting eleven and asked his players to show their true colours against the Cod Army. Those selected duly stood up and were counted. The victory was rooted firmly in some basic principles: no-nonsense defending, organisation and endeavour. Everything that Rovers lacked at Walsall, they showed in abundance here. Unlikely two-goal hero Tom Anderson and Andy Boyle put their heads in where it hurt and opted for ‘safety first’ defending. Craig Alcock and Niall Mason, players whose natural instinct is to defend, were recalled at full back in preference to attack-minded wing backs. And along with Luke McCullough, who screened the back four to very good effect, the determined defensive unit provided a platform for what turned out to be a routine and much-needed win. Anderson and Boyle, in particular, got Rovers on the front foot by bossing their individual battles. At the other end John Marquis and Alex Kiwomya worked tremendously hard to stretch Fleetwood’s defence and not give them a minute’s peace. Doncaster resembled a proper team again and from the moment Kiwomya converted Marquis’s 13th minute cross their victory never really looked in any doubt. Ashley Hunter sent two shots narrowly wide but Fleetwood, on the back of six straight defeats, visibly wilted and when Anderson poked home the second just before the half hour mark, reacting quickest after Marquis’s free-kick had been parried by Alex Cairns, it was effectively game over. Fleetwood, who sacked manager Uwe Rosler on Saturday evening, never threatened a comeback and Rovers added the gloss to a morale-boosting victory ten minutes into the second half when Anderson stayed forward and delightfully headed in Tommy Rowe’s inviting cross. A particularly bad defeat seems to jolt this Rovers team back to life. Earlier in the season they lost 3-0 at home to bogey team Walsall and responded by grinding out a 1-0 win at Bury. They beat MK Dons after a sobering defeat at Wigan and this response to last week’s big setback was probably the most impressive yet. Ferguson played 3-5-2 at Walsall to freshen things up but his side looked much more at home back in a 4-4-2 midfield diamond. 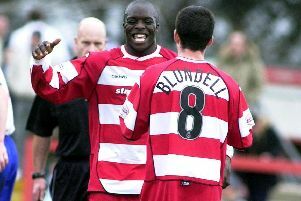 There was a very uncomplicated feel about the way Rovers went about their business and every player in red and white clearly understood their job in the team. A flexible approach to formations is a big part of Ferguson’s management style but the manner of this performance might just tempt him to see the season out with a flat back four. Ferguson showed a lot of trust in Alfie Beestin by employing him in a right-sided midfield role - and the youngster rewarded that faith by putting in an excellent display, full of guile and composure. Defensively he won’t give you a lot. That’s not his game. But the more you see of this lad, and the obvious technical ability he possesses, you do start to wonder if Ferguson has uncovered the heir to James Coppinger’s throne. As the saying goes, ‘you can only beat what’s put in front of you’. Rovers were absolutely desperate for a win, and also a good performance, and they probabaly could not have picked better opponents. Fleetwood’s confidence looked shot the minute they went behind and it was no surprise to later learn of Rosler’s fate. Despite investing in the likes of Paddy Madden and Toumani Diagouraga, they looked every inch a team nosediving towards League Two.